Are Central Valley steelhead really ‘threatened’? Carson Jeffres, field and lab director at the UC Davis Center for Watershed Sciences cradles a wild steelhead he caught and released on the Feather River. The primary goal of the federal Endangered Species Act (ESA) is to shorten the government’s list of “endangered” and “threatened” species. The American Peregrine falcon, the brown pelican, the eastern Steller sea lion and California populations of the gray whale are among the iconic creatures that have recovered to large populations and have been “delisted,” thanks to the strong conservation measures afforded under the 40-year-old law. But there is another, less congratulatory way species have made it off the lists: new and better information becomes available showing a species is no longer or never was in danger of extinction. Though better known for saving species, the ESA also has had the salutary effect of encouraging continuous scientific monitoring and studies of listed species to confirm or update their status. A good example is the Sacramento splittail. The U.S. Fish and Wildlife Service listed the native California fish as threatened in 1999, but delisted the species in 2003 because new information showed it was more abundant and resilient than once thought. Central Valley steelhead could be delisted for similar reasons. Steelhead are the anadromous (sea-run) form of rainbow trout. The Central Valley steelhead is considered a Distinct Population Segment under the ESA, making it equivalent to a “species” for listing purposes. The National Marine Fisheries Service (NMFS) designated these steelhead as “threatened” in 1998 and reaffirmed the status in 2006. The listing followed a severe decline in naturally produced (wild) steelhead returning from the ocean, the result of dams blocking access to much of their former spawning and rearing habitats. 1. Recent studies show that wild steelhead and resident rainbow trout in Valley rivers freely mate and form one interbreeding population. Rainbow trout that have never seen the ocean can produce young that become steelhead, while the progeny of steelhead may opt to stay in fresh water. The decision of whether or not to migrate out to sea appears to be only partly genetic. Conditions in fresh water also seem to play a role. Why risk an ocean voyage when there’s plenty of food right at home? 2. This steelhead-rainbow trout population below Valley dams is genetically linked to steelhead raised in hatcheries built to mitigate for the big dams. Because Central Valley steelhead historically were smaller than steelhead from coastal streams, the state brought the latter into the hatcheries to provide better sport for anglers. These fish, mostly from the Eel River, still dominate hatchery runs and their genetic signature is now present in both resident trout and wild steelhead in all Valley rivers below dams. NMFS data suggest that wild steelhead in the Central Valley are now more related to steelhead in north coast streams than to the distinct native populations of trout above the dams. 3. Most steelhead in the Central Valley are produced by hatcheries, not by wild spawning fish. We know this because all hatchery steelhead are marked. Hatcheries remove the adipose fin so anglers can readily distinguish artificially produced fish from protected, naturally spawned ones. Because hatcheries can raise many fish from a few adults, they can select for the steelhead life history. They can do so even if nature selects against it, as seems to be happening in the rivers. And these fish can stray to interbreed with wild fish. 4. Non-migratory rainbow trout are thriving in cold waters below dams while steelhead – even those from hatcheries – have low survival rates. Most steelhead juveniles seem to die before they reach the ocean, provided they don’t settle down to a resident life. Probably the most viable population of naturally reproducing steelhead in the Valley resides in Tehama County’s undammed Deer Creek. But even this population is genetically more like coastal steelhead and mixes freely with rainbow trout. Having wild steelhead moving up our rivers is a wonderful goal. They are lovely, lively fish remarkably adapted for survival – despite all the problems we create for them. But this same adaptability also has made wild steelhead scarce in the Central Valley. There’s little reason for a fish to go to sea when their rivers provide enough food (including juvenile hatchery salmon) for rapid growth to fairly large size (18-24 in). Add to this the low probability of surviving the journey to the ocean and back, especially with so little rearing habitat for migrating fish in the lower rivers and the Delta. Fish potentially capable of being steelhead often do better as resident rainbow trout. Should Central Valley steelhead be delisted? Politically, that’s a tough call. The federal listing brings money and water to protect the fish, with ancillary benefits to other fishes. And the ESA and the federal Central Valley Improvement Act require operators of federal and state water projects to improve the steelhead fishery because project dams ultimately caused its decline. The status of these steelhead has not improved much, if at all, since their listing 15 years ago. In fact, it could be argued that they no longer exist in Valley rivers, except, perhaps, deep in the genome of the present rainbow trout-steelhead, whose closest relatives seem to live on the coast. The fish have adapted to a wide variety of artificial and natural habitats, reflecting their general resilience. But overall they’re simply not the same fish we had historically. Right now, efforts to improve conditions for Central Valley steelhead are diffuse. Because it’s a listed species, every Valley stream must be managed to some extent to favor them, spreading resources thin, and resulting in limited success overall. Meanwhile, every year, hatcheries crank out thousands of juvenile steelhead that reflect more a coastal than Valley heritage. • Include the above-reservoir populations of native rainbow trout as part of the Distinct Population Segment. They may include the only “true” Central Valley steelhead left; some have developed a migratory life history that uses the reservoirs, rather than the ocean, as their destination. These migratory populations particularly need to be inventoried and studied to determine their genetics, status and habitat requirements. • Focus conservation on the few streams that have track records of producing wild steelhead, regardless of genetic heritage. Those include Deer and Battle creeks. Don’t waste money trying to increase steelhead in marginal streams such as Putah Creek. The same goes for rivers downstream of dams that support thriving populations of rainbows; if conditions change so that the steelhead life history is once again favored, a steelhead “population” will develop naturally. • Loosen restrictions on sampling of steelhead and rainbow trout for scientific research on their status and history. Otolith studies are particularly useful, even though they require lethal sampling. • Make a full-fledged research effort to determine what conditions below dams create the steelhead life history. The state’s Nimbus Fish Hatchery on the lower American River artificially spawns adult steelhead marked with an adipose fin clip. The broodstock appears to be genetically closest to Eel River steelhead. 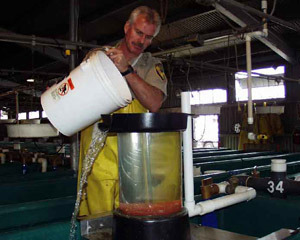 The state Feather River Hatchery and the Coleman National Fish Hatchery on Battle Creek also produce steelhead. Photo: California Department of Fish and Wildlife. 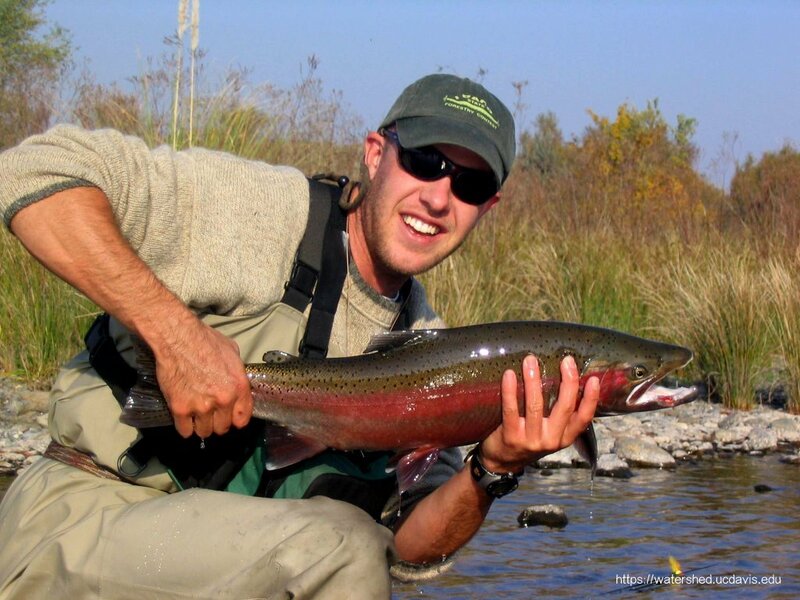 • Critically evaluate steelhead hatchery programs not only for how much they contribute to the fishery but also for the effects of hatchery fish on the success of wild-spawning fish, including resident rainbow trout. Studies are also needed on why so few juvenile steelhead survive after being released from hatcheries. Whether or not Central Valley steelhead are delisted, we clearly need a more realistic policy on their management. That policy should work with our new understanding of the genetics of today’s fish and on interactions between steelhead and rainbow trout, and between hatchery and wild fish. The new policy should put some trust in the natural adaptability of rainbow trout and be future oriented, because the biggest challenge in the future is going to be to providing enough cold water for any trout, resident or migratory, as the climate inexorably warms. Peter Moyle is a UC Davis professor of fish biology who has been documenting the status of California native fishes for the past 40 years. He is associate director of the university’s Center for Watershed Sciences. Courter, I.I., D. B. Child, J. A. Hobbs, T. M. Garrison, J. J.G. Glessner, and S. Duery. 2013. Resident rainbow trout produce anadromous offspring in a large interior watershed. Canadian Journal of Fisheries and Aquatic Sciences 70: 701–710. Eilers CD, J Bergman & Ryan Nielsen. 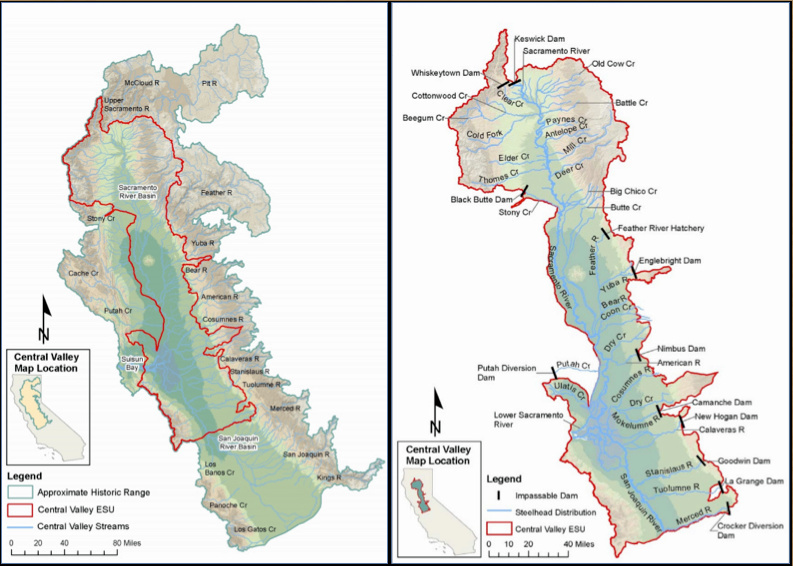 2010 A comprehensive monitoring plan for steelhead the California Central Valley. CDFG Administrative Report 210-2. Katz, J, P. B. Moyle, R. M. Quiñones, J. Israel, and S. Purdy. 2013. Impending extinction of salmon, steelhead, and trout (Salmonidae) in California. Environmental Biology of Fishes 10: 1169-1186. DOI 10.1007/s10641-012-9974-8. Williams, J. G. 2006. Central Valley Salmon: A perspective on Chinook and steelhead in the Central Valley of California. San Francisco Estuary and Watershed Science, 4.
its Alteration by Dams, San Francisco Estuary and Watershed Science. 4, 1-19. Zimmerman, C. E., G. W. Edwards, and K. Perry 2009. 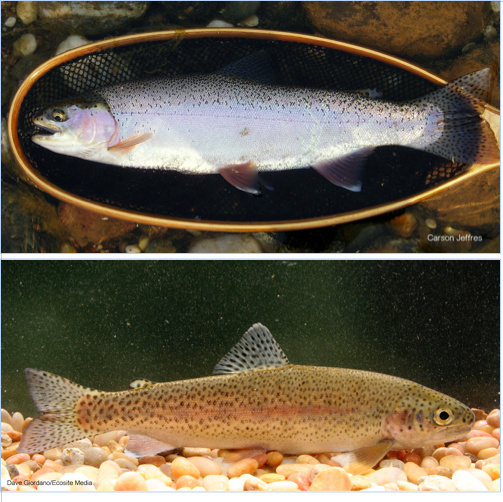 Maternal origin and migratory history of Steelhead and Rainbow Trout captured in rivers of the Central Valley, California. Transactions American Fisheries Society 138:280-291. This entry was posted in Uncategorized and tagged Central Valley, Endangered Species Act, Peter Moyle, steelhead. Bookmark the permalink. 11 Responses to Are Central Valley steelhead really ‘threatened’? Yes, Central Valley steelhead are threatened by the proposed “New Peripheral Canal” and its potential to remove even greater percentages of northern California water from the Central Valley River system. In Peter’s inexorable search for grant funding we will continue to see stories of this nature that are readily refuted by what he would term “anecdotal” observations. These anecdotal observations have been recorded by thousands of fisherman who recall and have photos from their various unscientific samplings, fishing adventures. The reduced populations and the forced integration of a somewhat related strain should be all the evidence needed to document a threat. Most of those reduced populations occurred well after the construction of dams. The reduction in numbers correlate much better to the amount of water taken from the river system which was transported south at great taxpayer expense. However, Peter’s assessment seems to indicate that a procreating population retained within a small area should be considered adequate for delisting purposes. How is his view different from those that capture and retain a few representative species in a zoo or biological preserve? I completely agree. It seems like one of our pre-eminent “experts” has given up. I think that this blog has generated a bit of confusion. I have had a number of interesting conversations with Peter Moyle on the topic (full disclosure: I study under him at UCD). First: I do not believe he is proposing de-listing all steelhead in the Central Valley. He is suggesting that we appropriate resources to the above-dam populations that represent the remainder of a genetically distinct steelhead population that has disappeared. The below-dam populations have, yes, dwindled. But the question proposed is this: How many resources do we want to place on an Eel River fish maintained in the Central Valley by hatcheries? Peter suggests we would have more resources to manage other populations that are imperiled if we move away from protecting stocked fish. Second: We all agree that salmonid populations have declined since the introduction of dams (and other aspects of California’s water system). It would be good to get big runs of fish back. But just short of tearing down these dams, what measures can be proposed to protect diversity? Diversity (genetic, population and species) is different than abundance, which is the main contribution of a hatchery-based management program. Third: Moyle’s Lab is all about anecdotal observations, and the fishermen who make them. They drive many of the questions we ask about California fishes. But we are scientists, and by training, we have developed this habit of trying to find the best data to support–or reject–the hypotheses generated. This is not as bad an approach as it sounds, especially when the anecdotes start to contradict other anecdotes, but it does take time and thoughtful research. Fourth: However, all research proposals aside, I know for a fact that Peter is doing okay in his “inexorable search for grant funding”. He shouldn’t need too much more for a couple of years or so. But even if we really believed that we should judge the argument not on its merits, but on the man, then let us look carefully: 30+ years of commitment to the conservation and understanding of California salmonid, native and other cold water fishes populate his record from top to bottom. How many academics also act as conservation advocates? And looking objectively, why would he really risk that hard-won credibility? Seems unlikely, even if you are trying to build a straw man argument. Pingback: Are Central Valley Steelhead really threatened? I vote to keep them listed. It seems from the studies we are unsure if we still have Central Valley Steelhead or the changes in tailwater fisheries over the last several decades have just produced healthy strains of non-steelhead rainbows.